All recharged, thanks to Laura and Grant. Phones, devices, spirits all topped off. 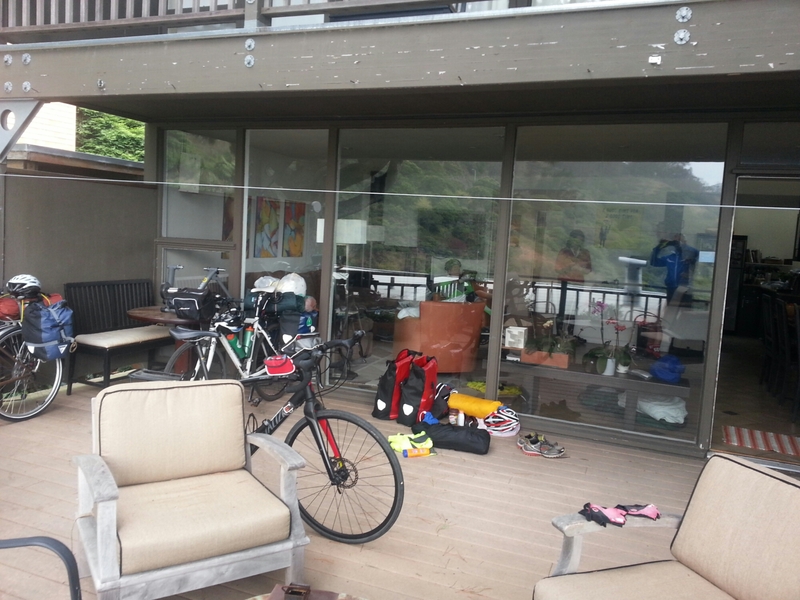 Their balcony/deck, taken over by our bikes and gear. Laura made us Ranchos Heuvo (I’m pretty sure I butchered that) and lots of fruit for breakfast. They insisted we take everything but their furniture with us. 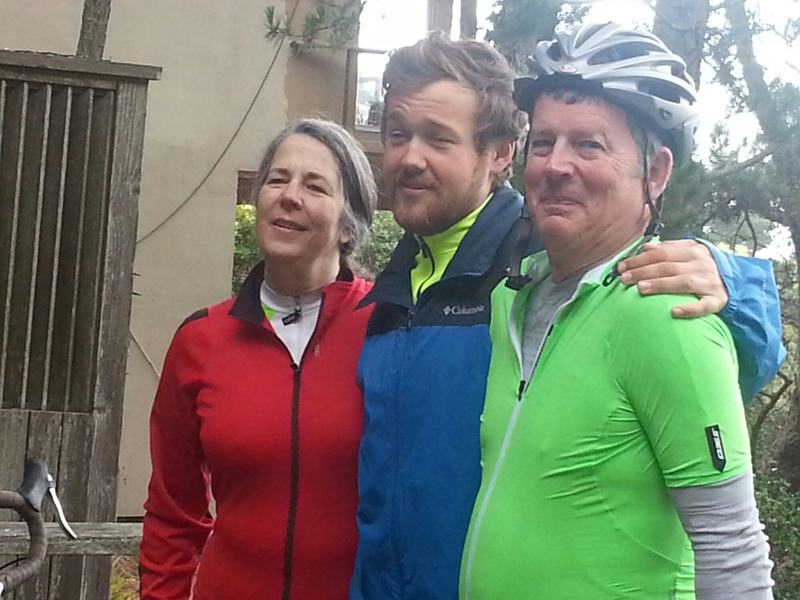 They donned their cycling gear and mounted their CoMotion tandem to ride with us to the Marin Highlands. Their bike has a belt drive for the idler chain and couplers to take it apart into three sections if they choose to travel with it. Pretty neat. I was more impressed when they jumped on and pedaled up the short but 22% driveway that leads to their house. Bob and Brian walked it. The ride took us back down to Sausalito (wheeeeee) and up Mill Road. I rode this a few years ago when in San Francisco. It winds up through homes built into the hillside among giant redwoods. Imagine having your landscaping being centuries-old trees. After about 1700 feet of climbing, they pointed us towards Muir Woods, gave us hugs and wished us well. If the sun had been out, it would have another scenic day, but it wasn’t, it was very cool and we were only kept warm by the serious climbing. 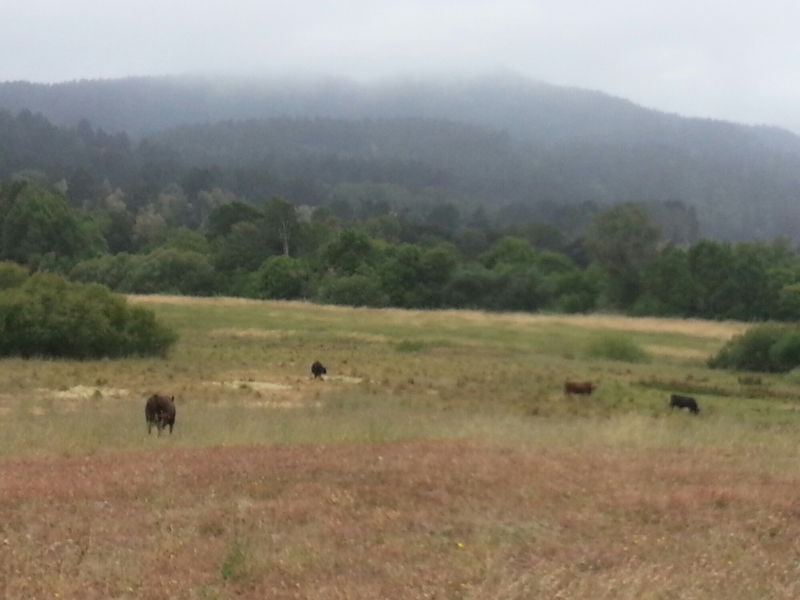 We rejoined The 1 before Point Reyes Station where we elected to stop for lunch at a deli. It was a tourist town and there was some kind of kids activity going on, music and dancing. We rolled past and resisted the urge. 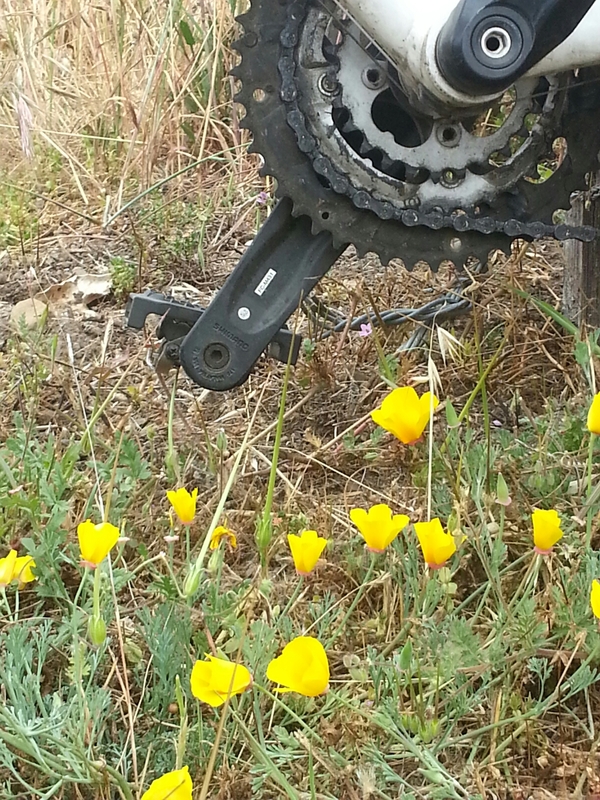 The next several miles were along Tomales Bay, rolling hills and wind mostly in our faces. A brief detour inland and on to Bodega Bay. This section of the PCH is very popular with the motorcyclists. Lots of groups from Harley tourists to knee dragging sport bikes, another thing to watch out for. Camping in the Bodega Dunes park, part of the Sonoma Coast State Park. Few pictures today, mostly because the vistas were limited by clouds/fog. The wind and early climbs made the 65-ish miles seem longer. But, a big dinner makes everything better. No set plan for tomorrow, maybe Anchor Bay, maybe Manchester. p.s. Happy belated birthday Dad!